Cool Lollipops That Keep Kids Occupied! While most people with young children would certainly agree that shopping without the little ones in tow is the easier, faster, less stressful way to go, particularly during the holiday season that can seem impossible. We’ve all got a dozen more things to do and buy every day, and the typical shopping necessities don’t go away as the holidays draw nearer. At some point in time, if not every time, most of us find ourselves staring the realization in the face that we must tackle the grocery store or mall with the kiddos. And that is no easy realization to swallow! Luckily, we have some unique candy that is easy to swallow. And it’s entertaining, too! Candy Bear Finger Friends Lollipops – When the line at the register is long, and the guy in front of you is about to make the most complicated return ever conceived, it’s time to break out something sweet, cute, and long-lasting! A gummy bear will be gone before he’s even started to explain how his coupon didn’t take, but these colorful, cute lollipop bears should last until your gift receipt prints! 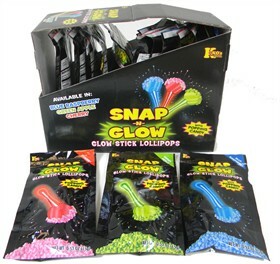 Snap and Glow Popping Lollipops – I can handle the blustery winds, I can shovel the driveway without much complaint, but one thing about winter I’ll never get accustomed to is how early it gets dark! Christmas shopping often finds us going out of our way for gifts, traveling farther than we typically do, and making the kids even more antsy to hear a “yes” when asking “are we there yet?” Unfortunately, car rides can be even more boring than usual for our backseat passengers when it’s dark and they can’t even take in the sights! These bright and tasty glow in the dark lollipops can help take the edge off in green apple, blue raspberry and cherry flavors. Browse our full selection of lollipops and stock up on sweet shopping sanity! Stuff Those Stockings Early for Thanksgiving! As long as I can remember, I get most excited about stocking stuffers. I love my ‘big gifts’ as well, of course! But that oversized, Christmas sock stuffed to the brim with candy, lotions, perfume, nail polish and more is what sets my Christmas morning heart aflutter. So – why reserve that feeling to just one day a year when it can just as easily happen twice? Why, indeed! This Thanksgiving, I’m breaking out the stockings early, and asking guests to bring theirs along as well. I’m heading out to do some shopping tonight, so I’m going to pick up a nice selection of stocking stuffers for people to gift one another. I’ll also get some goodies right here at Blair, of course. A stocking isn’t a stocking without a serious selection of candy! But it isn’t the bubble bath and Bursting Berry Blow Pops that will make these stockings extra special – it’s the notes of thanks, appreciation and love we’ll each be slipping inside them. 3.) Lastly, I’ll ask everyone to write something thoughtful about everyone else there – one thing per person. It could be something about that person they particularly enjoy, something that person has done for them that they are thankful for, or really anything that would be nice to know or hear from someone you care about. Just like the candy and non-candy treats, these sentiments will be nestled in the stockings, adding up to paper slips far sweeter than even Pixy Stix! Once complete, we’ll all sit around together and take turns reading our slips aloud. While eating candy, naturally! I hope some of you will consider trying this at your home this year. 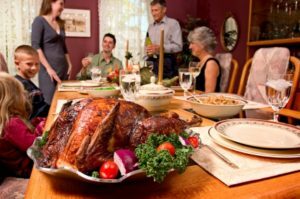 Even if your plans do include spending Thanksgiving evening in line at a favorite store, don’t forget to give Thanksgiving its fair share of the spotlight. We all have things to be grateful for, big and small, and we couldn’t stuff all our blessings in a stocking if we tried.